Traficante is relatively new to the cigar scene - established in 2015. Their focus is on very small batch, extremely limited production of cigars. They max out production at 1,000 cigars daily - compare that to other boutique cigar producers that exceed that many times over. 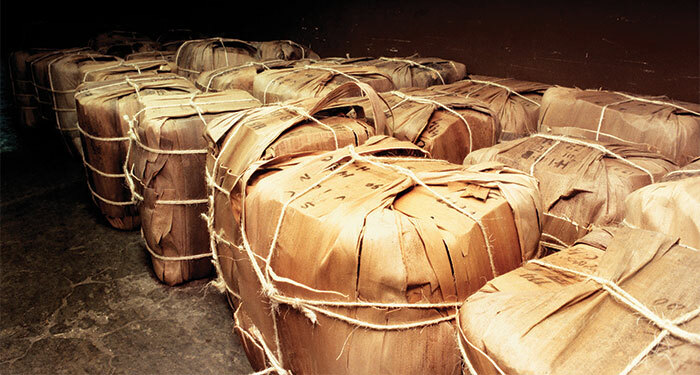 Typical aging for Traficante stogies includes two phases: Typical fermentation followed by barrel-aging. This may be where their cigars gain that unique aroma. In 120-pound groups, they pack the wrappers into barrels where they sit for 2-years at a minimum. The filler is fermented and then part of the mid-stem is removed by hand. Next it's bundled into 130-pound groups and placed into tercios - bales made of royal palm bark. Tercios look like this and are fairly expensive to create since each needs to be created and bound by hand. It's a typical and traditional Cuban style of aging tobacco that permits it to age in a slow, continuous manner. Tercios-bound filler is aged for up to 2-years. At the conclusion of the two-year span, the filler tobacco is packed into Dominican rum barrels and left to age longer. Traficante has plans to expand this rap-centric line - calling it Icon. Here's a sneak peak at other rappers they'll be featuring! Any fan of 90s rap will instantly recognize Biggie's mug on the band. The iconic photo is the work of Barron Claibrone's commission for the cover of Rap Pages magazine. Taken in March 6 1997, the photo captured Wallace as the "King of NY" just three days before he was gunned down. As it pertains to the cigar, Biggie was emblematic of Brooklyn in the 90s and the band fits that notion. It's simple and clean - the only markings on the mustard yellow band are the portrait of Wallace and "BROOKLYN" across the back. I dig the aesthetic and my lone complaint is the sticky backing on the band. There was an adhesive slightly tackier than the back of a Post-It note on the back - sticky enough that I had no problem adhering it to the table at which I was sitting. It did not damage the cigar to remove but I can see how it might - which is the main concern. I haven't examined the other Traficante bands to see if this is their common practice or singled out to the Brooklyn bands. Brooklyn is a stout feeling cigar. 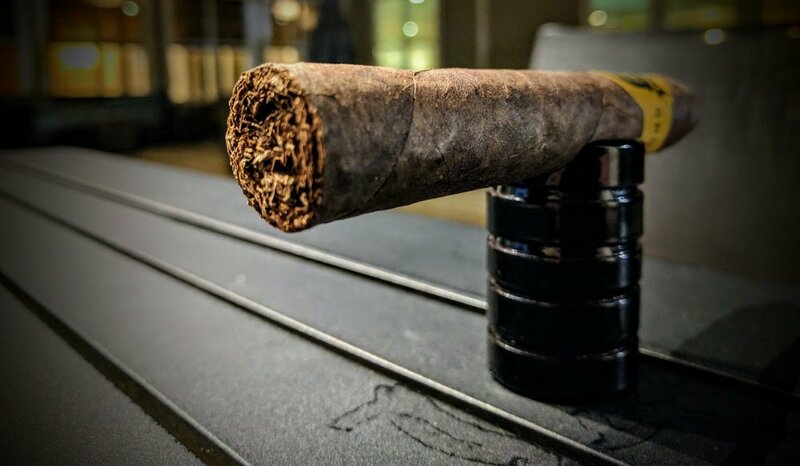 For a maduro wrapper, it's a little on the light side - leaning more towards the shade of a Colorado wrapper - showing a light reddish hue across the otherwise mottled blackish, brown tone. The wrapper itself is toothy and shows several veins with the most prominent running from foot to cap. I never really mind veins in my wrappers but it's worth noting that they are slightly raised - which is the only real raised potion of the wrapper. The seams really could not be better - they sit completely flush and take some work to find. There are no blemishes that stand out - this is a great looking cigar. The wrapper has maybe just a light oily sheen to it - but is definitely more matte than oily. After lightly compressing, the cigar has just a bit of give. It's not spongy at all, more on the firm side. Towards the cap I found a couple softer spots, but they're close enough to the end that I'm hoping they won't present any issues while smoking. The torpedo cap is impressive in the manner in which it seamlessly blends into the body. Gently tapering, it's almost impossible to tell where the cap begins and the body ends. Fantastically done! The foot shows off a well rolled cigar - tightly packed with light and dark brown tobacco. All the cigars I received from Traficante have a very unique smell to them. It's very light and perfume-like. There is a definite sweet, flowery nature to it that is really unlike any other non-infused cigar I've encountered. Despite the aromatic smell, the cold draw brings some typical maduro flavors - predominantly light dried fruits - raisin, apricot and a little cherry. Some vanilla serves to unify everything nicely. The draw is perfect - just the right amount of air coming through the cigar. Traficante's Brooklyn starts out very tannin-y - dry on the palate - probably a result of the heavy dose of ligero it packs. Some of the dried fruit from the cold draw is still noticeable. For a maduro, there is not the usual immediate dose of chocolate, creaminess you might expect. Just a hint of light black pepper and some bitter coffee notes round the flavors out. The draw is great - no complaints whatsoever. The burn line is off to a good start. There is a little bit of variation and waviness but I'm betting it corrects itself shortly. About a half inch in and the ash is a very light grey/white marbled stack. It's a beautiful contrast to the dark maduro wrapper. Smoke production is great. Each puff spits out lots of white, aromatic smoke. While resting, the cigar sends out faint plumes to remind you it's there and still lit. The first impressions of this cigar really remind my of a dry, less sweet port. There is a distinct tannin-like quality that dries the mouth out paired nicely with a burst of grape/currant every so often. The initial black pepper has faded - smoking very smooth through the first third. The draw continues to be perfect. Any deviations from the first light have disappeared - the burn line is crisp and clean. Thea sh stacks to about an inch in neat white/light grey layers. At about the midpoint, a bit of black pepper returns. It's faint and certainly not a pepper bomb. There is still a light tannin-esque quality but that is starting to fade as the flavors develop to include some deeper jammy fruit flavors with a little brininess - definite raspberry jelly. The whole flavor profile has been backed by a definite charcoal char aftertaste. There's also an herbal quality to it - like drinking a strong, raspberry infused hot tea almost. Broken record: draw and burn are flawless. The ash continues to hold to about an inch before toppling - again, stacking perfectly. As I enter the final third, things are proving to be more complex. There's still some of the fruit that is basically the backbone of this cigar - strawberry/raspberry are the easiest to pick out. As I work through the last third, blackberry jam lingers on the tongue and is very enjoyable. But, again, the sweetness of the jam is countered by a grilled, charcoal, char undertone. I might have to grill some fruit to see how it compares. The savory aspect is starting to unfold more - offering up some light coffee notes and salty, leathery notes. I can't say enough for the overall draw/burn experience of Traficante's Brooklyn. It's been a joy to smoke with absolutely no issues. When I first lit this cigar up, I thought there was no way it was a full-bodied smoke. However, as I work down to nubbing this thing, the strength has kicked in and it's definitely leaning towards the medium-plus/full spectrum. Traficante's Brooklyn definitely brings some unique and different flavors - especially for my preconceived notions of a maduro. There is a clear development of flavors but at the end of the day, I wish it would have progressed more clearly to match the complexity on the palate. It seems to meander without a clear direction of how the flavors should progress. It's not bad by any means, but it tends to bring the same flavor repetitively rather than moving from one to the next. Definitely a very interesting smoke! The overall smoking experience is exactly what should be expected of a $16 cigar. It never required a relight, touch-up, etc. The burn rate and line were perfect throughout the entire smoke. Traficante put out a great cigar with Brooklyn. The strong fruit flavors and aroma are very enticing and one-of-a-kind. I do wish the coffee/leather found at the end would have developed more as I think that was a really interesting pairing but, as stated in the review, the flavors tended to wander a bit. I'll be grabbing a few more to see how the hold up with a little age on them and am absolutely looking forward to the other Icon stogies on the horizon from Traficante. For my first cigar from the young company, I was thoroughly impressed and eager to explore more of their offerings! We've been given a great opportunity to partner with Traficante Cigars Company and pass along an exclusive savings to our followers. Use ICON2017 to take 15% off any order. If you spend over $50 you also receive one of their Traficante Cigar Company "We are the Cartel" Patches.